Practice Areas: Telecommunications, Aviation, Insurance and Reinsurance, Mergers and Acquisitions, Company Formation, Business Crimes and Compliance, Construction and Infrastructure, Employee Benefits and Pensions, Employment and Labor Law, Environmental, Government Affairs, Intellectual Property, Litigation, Arbitration and Dispute Resolution, Toxic Tort and Products Liability. Fatima is the Head of Telecommunications and Corporate Team. 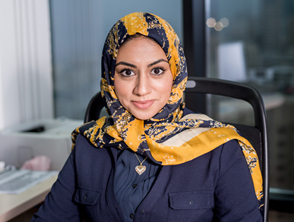 Fatima has strong experience and knowledge about the Telecommunications Law and the role, rules and regulations of the Telecommunications Regulatory Authority (TRA). She rendered provided legal assistance to our clients on various aspects of this dynamic business. Fatima also specializes in corporate law, including company formation and registration, restructuring, mergers and acquisitions, as well as liquidation. Fatima also assisted in the establishment of financial institutions governed by the rules of the Central Bank of Bahrain (CBB) including the preparation of and review of all relevant legal and statutory documents and conducting due diligence. She is also experienced in a broad range of matters including arbitration, litigation, banking and finance, employment law, and intellectual property. Fatima led the team assisting VIVA Bahrain in its acquisition of Mena Telecom. Fatima led the team assisting Bahrain Tourism Company BSC as offerree of a takeover offer by two companies, which was eventually finalized in favor of Gulf Hotels Group BSC. Fatima assisted in the merger of Solidarity Bahrain BSC (previously Al Ahlia Insurance Company BSC) with Solidarity General Takaful BSC (c).